Thanks again to Charlie, Marion, Fran, & Al for their generosity, giving us Golden Coupons (activity passes from their hotel package). Today we used the coupons for a Mansions by the Sea Trolly Tour. The trolly gave us a glimpse of the beachside of Cape May, rather than the two main streets we’ve used all week for entering/exiting town. We saw lovely homes from the 1800’s and 1900’s and were provided a brief description of the architecture along with some background about the development of the cape. Cape May is now a National Historic Landmark District. 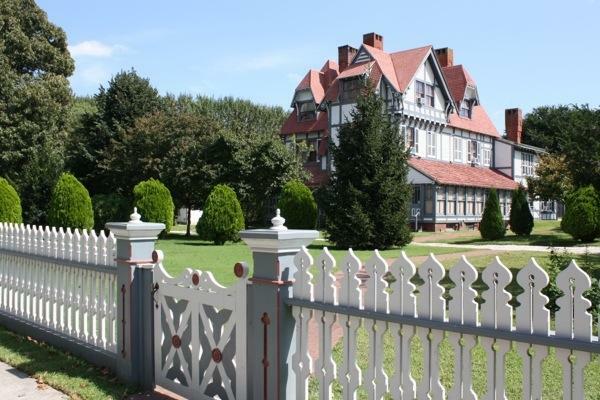 We also used the coupons for a tour of the Dr. Emlen Physick Estate; built in 1879 this Victorian home is now a museum maintained by the Mid-Atlantic Center for Arts and Humanities. We had a very knowledgable tour guide who provided a detailed description of Victorian lifestyle among the wealthy Physick family. Dr. Physick was never married, however lived with his mother and aunt. He also never practiced medicine; although he had completed medical school to follow in the footsteps of his grandfather, upon graduation he inherited his family fortune and then decided to travel prior to retiring in his newly built home in Cape May. The 18 room house was designed by architect, Frank Furness, from Philadelphia, PA. Mr. Furness did some experimenting with convection heating in this home. The 18 fireplaces (one in each room) had never been used, yet each one had a vent that allowed heat from a basement coal burning stove to filter its way throughout the house. He installed plumbing and hot water. The woodwork throughout the house was intricate, Mr. Furness only allowed oak and chestnut to be used. Mr. Furness also designed much of the furniture in the house. The Mid-Atlantic Center for Arts and Humanities continues to restore the Dr. Physick home to its original state and incorporate only decor appropriate to the Victorian period. This tour was a nice comparison to the Elms mansion we toured in Newport, RI. Ok, so we squeezed in a little more history…and then headed straight for the bar! We found one bar that served Cape May Brewing and wanted to try a local brew. The brew on tap was a Honey Porter. Sorry, Cape May, but this porter was lacking taste and body. One was just enough. Back home to prep for our trip up the Delaware Bay tomorrow.